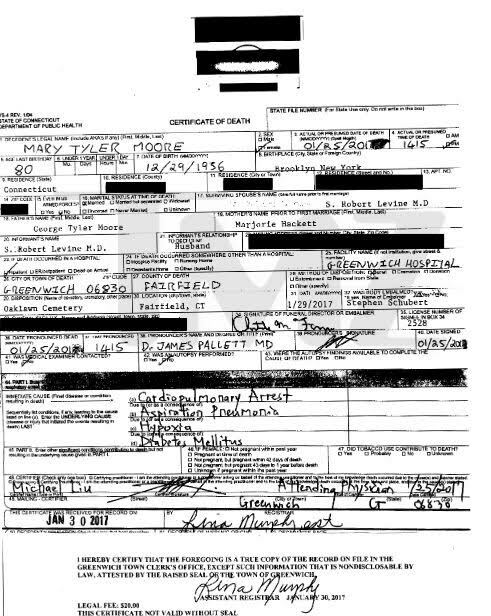 Those asking how did Mary Tyler Moore die have had their question answered but with shocking results.According to the just released death certificate of late actress,her cause of death was attributed to cardiopulmonary arrest brought on by 3 other serious medical condition. oxygen to her tissues) and diabetes mellitus. Cardiopulmonary arrest is when the heart stops beating which is technically not a heart attack. The results certificate shows Moore was pronounced dead at 2:15 PM on January 25, 2017, the 80-year-old actress passed on in a Connecticut hospital after life support was withdrawn.